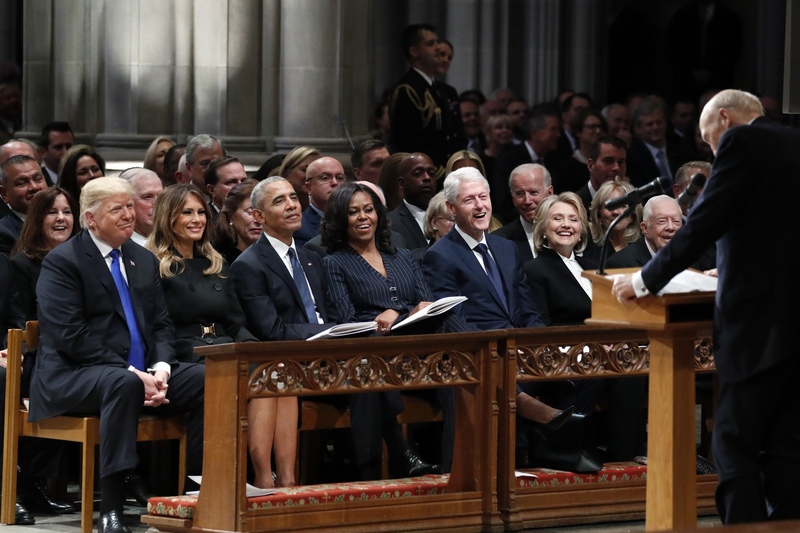 The nation’s most powerful leaders filed into the National Cathedral in Washington, D.C., Wednesday for the state funeral of late President George H.W. Bush. All living presidents and spouses made the trip and sat in the front row for a series of speeches regaling Bush’s life and legacy. There were many laughs and emotional moments in the program — but no one better canonized the life and times of the late Bush than renown historian Jon Meacham. Meacham, who knew Bush’s strengths and weaknesses well, penned a biography about the former president and noted Bush’s shortcomings in his speech. The line drew belly laughs from the audience, including George W. Bush in the front row. “His tongue may have run amuck at moments, but his heart was steadfast. His life code, as he said, was: tell the truth. Don’t blame people. Be strong. Do your best. Try hard. Forgive. Stay the course. And that was and is the most American of creeds,” Meacham concluded. H.W.’s casket left the Capitol rotunda earlier Wednesday after lying in state for two days and will board Air Force One bound for Texas after the National Cathedral ceremony.